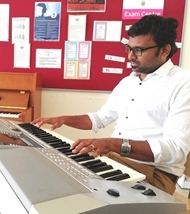 He has been teaching Piano / Keyboard since 20 years. He had performed in different bands in India and abroad. Presently he is working in Candor International School, Bangalore as a music faculty.